The Zwick Center for Food and Resource Policy at the University of Connecticut released an updated report on food insecurity and obesity in Connecticut. The study was authored by Rebecca Boehm, Jiff Martin, Jaime Foster, and Rigoberto A. Lopez, and titled "Food Insecurity and Obesity Incidence Across Connecticut". Madison was ranked number 99 for the percent of residents reported as Food Insecure (higher rank = fewer residents food insecure) out of 170 towns in Connecticut listed on the report. The report found that Madison had a 7% rate of Food Insecurity, and a 29% rate of Obesity. A two page summary of the report is available here. In Connecticut, obesity rates have steadily increased since the early 2000s. Food insecurity rates in Connecticut are higher for households with than without children under 18, with 14.8% of Connecticut households with children reporting food insecurity in the last 12 months compared to 11.0% of households without children. In 2016, the adult obesity rate climbed to 26.0%, compared to 21.8% in 2010. Rates of obesity (excluding overweight) also increased among Connecticut high school students, from 10.2% in 2009 to 12.3% in 2015. The incidence of overweight and obesity was substantially more widespread across Connecticut’s towns than food insecurity. 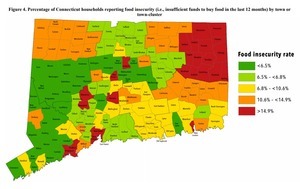 Rates of food insecurity in Connecticut have remained relatively stable over the last five years.